Demonstrators in Portland marched to Pioneer Courthouse Square. 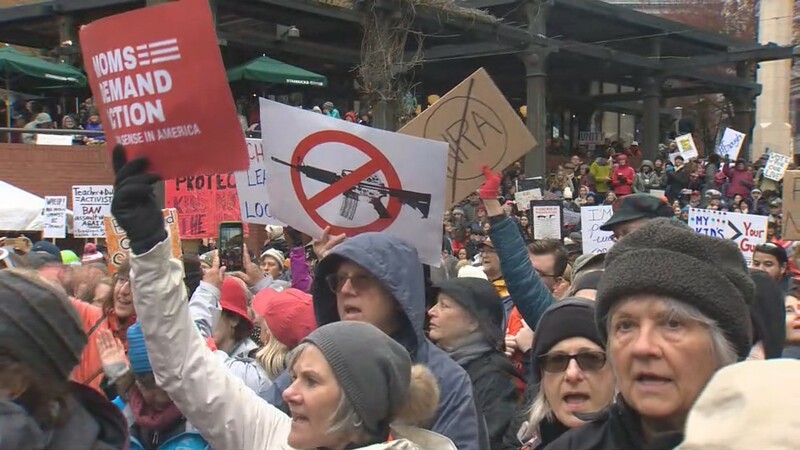 PORTLAND, Ore. – Thousands of people gathered in downtown Portland and marched through the streets calling for an end to gun violence and for action to prevent mass shootings in schools. Portland was one of hundreds of cities across the country holding a March for Our Lives rally Saturday as part of a national student-led demonstration. Demonstrators arrived at the North Park Blocks in downtown Portland before 10 a.m. and marched to Pioneer Courthouse Square. Thousands of people gathered in Portland's Pioneer Courthouse Square. One by one, students stepped to the microphone and spoke out against gun violence in schools. "If you do not value us and our right to live, we will vote you out because enough is enough!" Calum Nguyen, a student organizer, shouted to the crowd. "Freedom in America does not mean you get to own unnecessary weapons of war, it means you go to school and you get to feel safe," said Alexandria Goddard, a student organizer from Sunset High School. 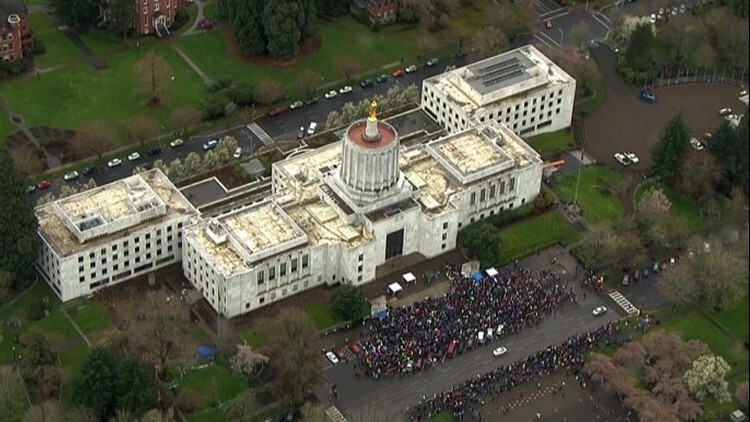 Portland police estimated that 12,000 people attended the event. The rally concluded with a concert from Grammy Award-winning Portland band Portgual. The Man. Watch the performace of "Feel it Still"
"We’re here to lend our support to your movement," said Eric Howk of Portugal. The Man. "This is a crowd that represents incredible bravery and progress." The national demonstration came just a little more than a week after students held a national walkout for 17 minutes, to recognize the 17 people killed during the shooting at Marjory Stoneman Douglas High School in Parkland, Fla. Led by students who survived the shooting, a national conversation about gun violence and school safety has re-ignited throughout the country. In addition to Portland, around 1,000 people marched in Salem and hundreds more attended the Vancouver march.